In his past life, Mo was a Mongolian horseman, serving under the great Genghis Khan. He had chopped numerous heads and wore them as trophies around his neck. Besides mangling innocent life into ornaments, he also enjoyed riding a lot. He wanted to be the greatest horseman on the Mongolian pasture and then die on horseback, hacked into pieces by his enemies. This might sound odd to our modern reader, but if you considered all the horrible death that could have happened to a Tartar horseman, dying on horseback was the next best thing than dying of old age. But because of the irony of fate, his dream didn't come true. He was killed by a fallen rock when taking a pee by the hillside, hardly a heroic death for a fearless Mongolian rider. His brutal hobby of mass murdering didn't fare well on the weighing scale of karma, and subsequently he was reincarnated as a hyrax in the Serengeti. His teeth were too blunt to chop heads. His legs were too short to ride anything of dignity. Yet his ambition of becoming the greatest horseman never subsided. Changing from a mass murderer into a grass-eating-ungulate wasn't particularly healthy to his psychological well being. He constantly suffered from a chronological self-esteem deficiency. To compensate for his vulnerability, Mo imagined himself to be something bigger, like an elephant. For some scientists, hyrax was considered to be the closest living relative to the elephants. Yet, the modern day hyrax lacked the formidable body size, and most importantly, the trunk. Some scientists argue that the original trunk of the elephant might have evolved into a "useful organ" on the male hyrax. Mo seemed to agree on such argument. He felt that a particular part of his body was as strong as the elephant trunk. But how would that help him in riding? Nature answered his question in the form of hormones. One day, when he was scouting for food, he spotted a female hyrax. The stimulus of hormones rose up in his body like a super tsunami. His elephant-trunk-evolved-organ urged him to action like the war drums he used to hear during the numerous battles. Brave like an elephant, Mo mounted on top of the female hyrax, like he once did to his faithful stallion (but in a slightly different angle, and with a bit more intimacy). Once again he felt like a fearless Mongolian horseman. The nasty feeling of shrinking ego was wiped cleared from his mind as he extended his elephant trunk to its full glory. He could taste the nostalgic brutality in the saliva of his mouth. 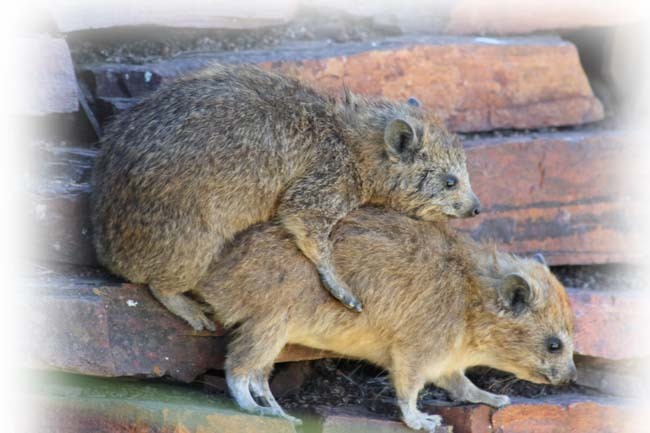 His dream of becoming the greatest hyrax rider had almost came true "ALMOST" if he had not been brutally mauled down by the jealous husband of the female hyrax. Poor Mo was dismembered into many little pieces. But this time, he died happily. He could proudly tell his ancestors that he had died when pursing his dreams. Moral of the story: It is better to die when pursing your dream, than just dreaming your dreams.